TriCounty Health Department Women, Infants and Children Program (WIC) received a Gold Loving Support Award of Excellence, on Aug. 1, 2018, the first day of World Breastfeeding Week. 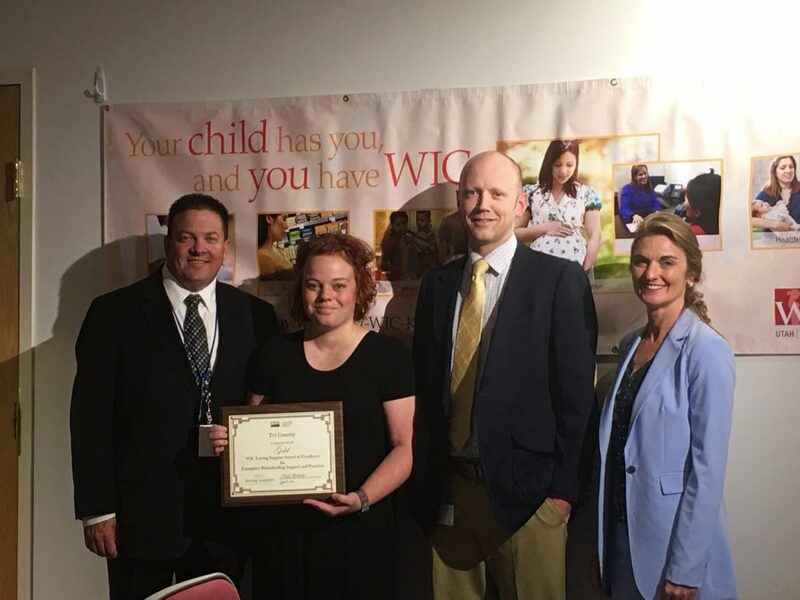 Director of TriCounty Health Department, Jordan Mathis, and WIC Program Manager, Katie Kissel, were presented the award in Salt Lake City at the Utah Department of Health. Seventy-eight awards were given nationwide, four of which were to Utah health departments. Awards were presented by the U.S. Department of Agriculture (USDA) and Food and Nutrition Services (FNS), recognizing exemplary WIC peer counselor programs, which lead to an increased number of WIC participants who breastfeed their infants exclusively for six months. TriCounty Health Department currently has one peer counselor and two certified lactation counselors, who work daily to improve mothers’ experiences with breastfeeding and are available to answer any questions. Breastfeeding support services provided through TriCounty Health Department are not limited to individuals enrolled in WIC and are available to the entire public. Tooele Health Department also won a Gold Award and Utah County Health Department and Davis County Health Department won a Gold Premier Award, the same day. Breastfeeding exclusively for six months provides the most health benefit for babies and mothers. World Breastfeeding Week is Aug. 1-7.